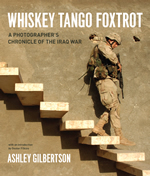 The California Literary Review, an online magazine, is running a great selection of photographs from Ashley Gilbertson’s recently published Whiskey Tango Foxtrot: A Photographer’s Chronicle of the Iraq War. The photos are accompanied by a short essay by the author discussing how he wound up on assignment with the New York Times covering the battle of Falluja—one of the fiercest battles of the conflict: In March 2004, four American contractors were ambushed in the center of Falluja, a city forty-three miles west of Baghdad. They were dragged from their cars, beaten, and their bodies burnt.… Back in Iraq, furious Marine generals who were supposedly in control of Falluja promised swift vengeance and on April 4 attacked the city with everything they had. Hundreds of Iraqis were killed in a week of intense urban combat.… My rotation had finished and I was at the bureau packing to leave the country when a scramble ensued to get someone from the paper to cover the battle from the frontlines. Times higher-ups contacted generals and politicians, and eventually we were given two… slots, one of them mine. I repacked my bags, this time including body armor and equipment I needed to file my photos . 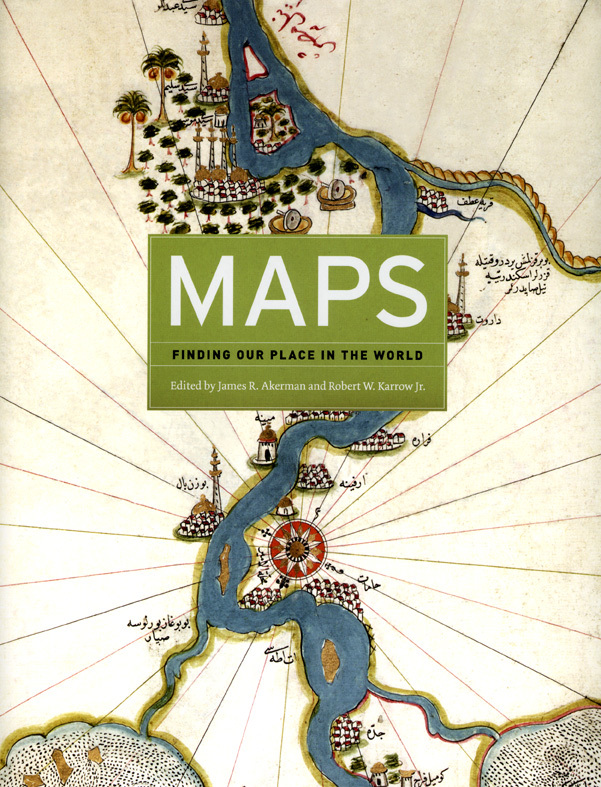 . .
James R. Akerman and Robert W. Karrow Jr.’s Maps: Finding Our Place in the World has been given quite a positive review in this month’s issue of the British science and technology magazine, BBC Focus. Praising the book for its thoughtful exploration of maps and the many divergent purposes they have served throughout human history, reviewer Nick Smith writes: If you though maps were merely aerial drawings of places that help us get from point A to B, you will be astonished by the depth and breadth of this book. 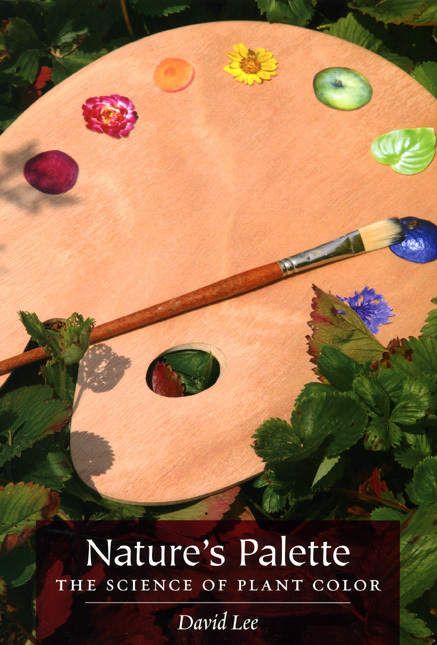 The editors have cleverly set out the book’s structure in terms of what function maps perform, instead of ranging from continent to continent as with traditional atlases. There is macro-mapping throughout the ages and maps portraying land use, as well as those concerned with commerce, art, advertising, entertainment and national identity. There is plant distribution, cartographic analysis of the geology of the US and even the “distribution of the slave population of the Southern States.…” Fascinating stuff. See a collection of unusual maps from the book. . . .
Last Thursday the Times Higher Education ran an enthusiastic review of Vanessa R. Schwartz’s new book It’s So French! : Hollywood, Paris, and the Making of Cosmopolitan Film Culture. In the review THE contributor and professor of film studies Ginette Vincendeau notes how the thesis of Schwartz’s book makes a fascinating departure from conventional views about the relationship between the postwar French and American film industries. Vincendeau’s review begins: In this provocative and original book, the American cultural historian Vanessa Schwartz revisits the vexed question of Franco-American cinematic relations in the postwar period. Much has been written on the subject, but Schwartz has no time for clichés about French “protectionism” or American “imperialism”. Instead, the central thesis of It’s so French! Hollywood, Paris, and the Making of Cosmopolitan Film Culture is that the French and the Americans were much more receptive (even affectionate) towards each other than Cold War-inspired rhetoric has made out. 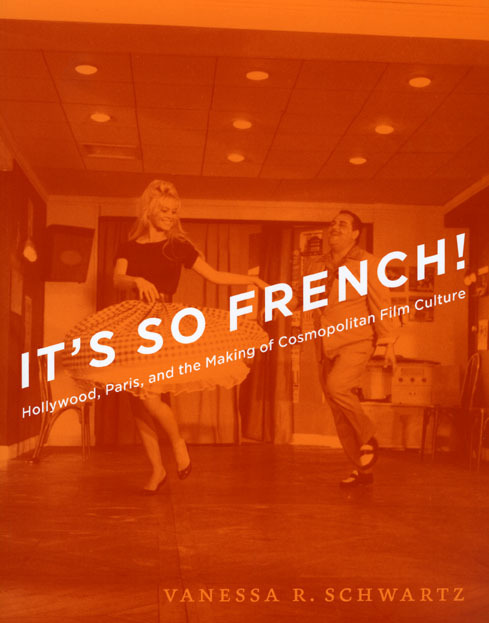 Furthermore, France as represented in American and French films of the 1950s and 1960s was key to the development of “cosmopolitan film culture”. Contrary to the common view that pits French art cinema against commercial Hollywood films, Schwartz claims that from the mid-1950s to the mid-1960s American representations . 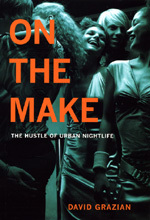 . .
David Grazian’s entertaining exploration of the bars of Philadelphia in On the Make: The Hustle of Urban Nightlife, continues to attract attention. Two new articles have recently been published featuring Grazian’s new book—the first appeared in the January 18 Chronicle Review and includes some great praise for the book’s revealing look at inner city nightlife: Grazian’s new book is, among other things, a long catalog of confidence games. Nightclub managers strain to persuade the world that their typical patrons are younger, less suburban, and more female than they actually are. For a secret payment of $500 per week, one Philadelphia publicist… will bring four attractive, well-connected friends to a club… There are also the more-familiar kinds of interpersonal fraud: In bars like Tangerine, people sometimes lie about their ages, their names, their jobs, and their marital statuses. Women give out fake phone numbers to shake off obnoxious suitors. People feign a sexual interest in others in order to score free drinks, to make their lovers jealous, or simply to make the evening less boring. “What’s skillful about the book is that these are settings that people are familiar with, but often don’t think very hard about,” says Joshua Gamson, a . . .
Today’s New York Times is running an article titled “Political Animals,” comparing the current presidential candidates election politics to the complex social dynamics found in other species like elephants, whales, and rhesus macaques—the latter of which are the subject of Dario Maestripieri’s new book Macachiavellian Intelligence: How Rhesus Macaques and Humans Have Conquered the World. In the article, the NYT‘s Natalie Angier cites Maestripieri’s book as she compares the political behavior of these prolific primates to our own: As the candidates have shown us in the succulent telenovela that is the 2008 presidential race, there are many ways to parry for political power.… just as there are myriad strategies open to the human political animal with White House ambitions, so there are a number of nonhuman animals that behave like textbook politicians.… As Dr. Maestripieri sees it, rhesus monkeys embody the concept “Machiavellian” (and he accordingly named his recent popular book about the macaques Macachiavellian Intelligence). “Individuals don’t fight for food, space or resources,” Dr. Maestripieri explained. 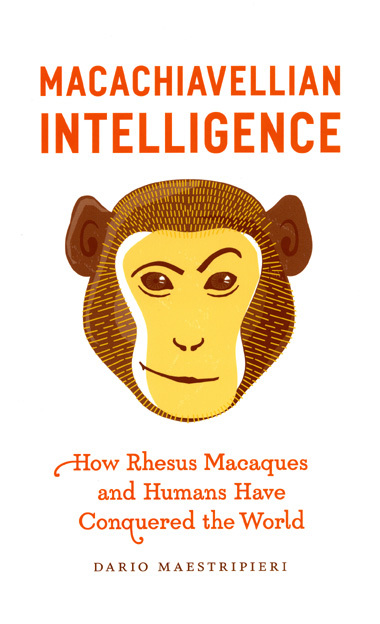 “They fight for power.” With power and status, he added, “they’ll have control over everything else.…” “Rhesus males are quintessential opportunists,” Dr. Maestripieri said. “They pretend they’re helping others, but they only . . .
All the news we can wrap in a Friday afternoon bundle: French and more French Vanessa R. Schwartz’s It’s So French! : Hollywood, Paris, and the Making of Cosmopolitan Film Culture got a brief write-up in the January 12 Financial Times. 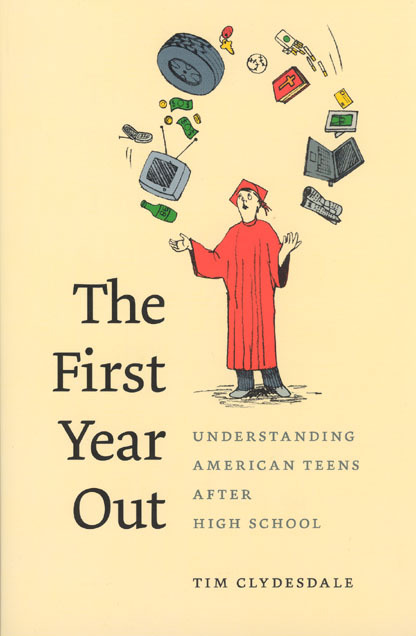 If you’d like more, navigate to the website of UC-Irvine professor of history and KPFK radio host Jon Wiener for archived audio from an interview he conducted with Schwartz for his show on Wednesday. A new job for John Nagl Lt. Col. John Nagl was the commander of the 1st Battalion, 34th Armor at Fort Riley. He served in Operation Desert Storm, was the operations officer of a tank battalion task force in Operation Iraqi Freedom, and was on the writing team for The U.S. Army/Marine Corps Counterinsurgency Field Manual. But now, according to this article appearing in Wednesday’s Washington Post, “he has decided to leave the service to study strategic issues full time at a new Washington think tank.” Nagl was also featured this Wednesday on NPR’s Fresh Air discussing his strategy for the future of counterinsurgency operations in Iraq. You can find archived audio here. Get your personal paparazzi David Grazian, author of On the Make: The Hustle . . .
Columbia University Press, University of California Press, and the University of Chicago Press announce a new joint publishing effort in South Asian Studies. The University Presses of California, Chicago, and Columbia are pleased to announce that the Andrew W. Mellon Foundation has awarded a grant to commence publication of a major book series covering South Asia. Titled “South Asia across the Disciplines” the new series aims to publish six monographs per year, in a collaborative effort across all three University Presses with each press publishing two series books per year. Each press has long-established roots in the field and is based at a university with outstanding South Asia faculty. In recent years, the market for South Asian studies books has declined along with the broader market for academic monographs in many fields, making it increasingly difficult for emerging scholars to get their work published. “South Asia across the Disciplines” will disseminate and promote new scholarship on South Asia by combining the efforts and resources of the three presses. . . .
Another review from the Times Literary Supplement: in the January 4 edition Peter Hainsworth takes on two recent translations of twentieth century Italian poetry, The Selected Poetry and Prose of Andrea Zanzotto and The Selected Poetry and Prose of Vittorio Sereni—both are the first substantial translations of these masters of Italian poetry for English speaking audiences. In the review Hainsworth delivers an enthusiastic appraisal of the two works: Sereni and Zanzotto … embraced negatives and contradictions more wholeheartedly and more energetically than … the poets of the previous generation.… The result in both cases is a particularly adventurous and exciting body of work, constantly in evolution, sometimes (especially in the case of Zanzotto) on the edge of flamboyant avant-gardism, but somehow generally able to keep its poetic balance. What also gives both poets and others of their generation substance is the fact that they have something to say. 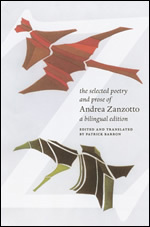 Sereni’s mature poetry is constantly probing issues of commitment, choice and understanding, often through a multiplicity of voices, criss-crossing and overlaying each other, with back references to his favorite poets or his own previous work.… They represent and enact the often dramatic confrontation of differing, often irreconcilable viewpoints and constantly changing perspectives. . . .